Bill Nye recently participated in a controversial debate with young-Earth creationist Ken Ham. 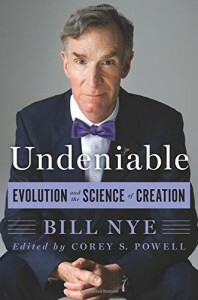 In his new book, Undeniable, Nye writes "For those readers who might be deeply religious, welcome... I did not disparage anyone's religion." 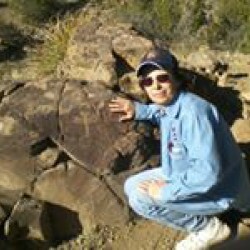 He notes that "many people... see no conflict between their spiritual beliefs and their scientific understanding of evolution." This fact always makes me wonder how individuals can be so sure they speak for God. When someone makes an assertion in science, scrutiny across the world and over time weeds out falsehoods. Similarly, in religions wisdom accumulates over time. Why some individuals cling to the past puzzles me. Nye writes that "evolution is one of the most powerful and important ideas ever developed in the history of science," with "essential practical applications." He fears that if the "pseudoscience of creationism" makes inroads into education, it "is an assault not just on evolution but on the whole public understanding of science." Nye refutes creationism. For example, Ham claims that 7,000 kinds of animals were on Noah's ark - there are 16 million species known today, so eleven new species would have come into existence every day under Ham's vision of the Great Flood to reach today's total. Surely someone would have noticed if that happened. Kangaroos would have had to climb down from snowcapped Mount Ararat and hop to Australia without leaving any sign they passed through. No recorded sightings, no bones in Tibet, and across a land bridge that left no trace of its existence. There's loads of information available about the debate on the internet. But most of the book goes beyond the debate with Ham. Nye begins with the major concepts of biology such as the age of the Earth, biodiversity, fossils, and mass extinctions; as well as history- the contributions of Darwin, Wallace, Lamarck, Linnaeus, Eldridge, Gould, and others. He addresses topics in the news, such as vaccine safety, genetically modified organisms, human cloning, racism, extraterrestrial life, and research into the origin of life on Earth. If you're already grounded in biology, you might skip to these chapters. Nye even tackles an evolutionary topic that leaves some people squeamish - the "short evolutionary distance" between us, apes, and other hominids. We can't say "that humans are no longer evolving, because we surely are." "Cue the spooky music." Nye is known for his TV series, Bill Nye the Science Guy, which "aimed to teach a specific topic in science [in each episode] to a preteen audience, yet it garnered a wide adult audience as well." In this same vein, the book avoids jargon and uses a conversational tone ("you and I ain't such a big deal," "I thought about how cool it would be," "he was in a bad mood in Tacoma") and personal references ("when I was a senior in college," "while my family was seated together eating a chicken dinner," and dressing up in a gorilla suit for a TV comedy). This makes the book quite accessible - as Steven Pinker says, statistics without stories are empty. In addition to a teen audience, adults who haven't thought about the subject since high school will enjoy the book. I think even quite young kids who are interested can handle it - if you know any youngsters who rattle off a dozen dinosaurs' Latin names, you may agree. I recommend this book to anyone unsure of evolution, new to biology, or interested in biology in the news. As Nye says, "evolution is inspiring" and "profoundly humbling" and well worth your time.